By agreeing to participate in the research we will ask you to provide us with your name, email address and an optional profile image. your name and a link to your website. The information we collect from you will be used to identify your contribution to the site and enable us to contact you about the information if necessary/update you about the research project. We will request on the site that you explicitly consent to be contacted by us regarding further information about this project, possible competition prizes and explicit consent for future use of your data in research by the research team. We will use your information according to the consent you have given by participating in the research. We will not disclose your personal information outside research project team members unless permitted under the Information Privacy Act 2009 (Qld). The project is a multidisciplinary research effort designed to enhance the monitoring of the Great Barrier Reef (GBR). 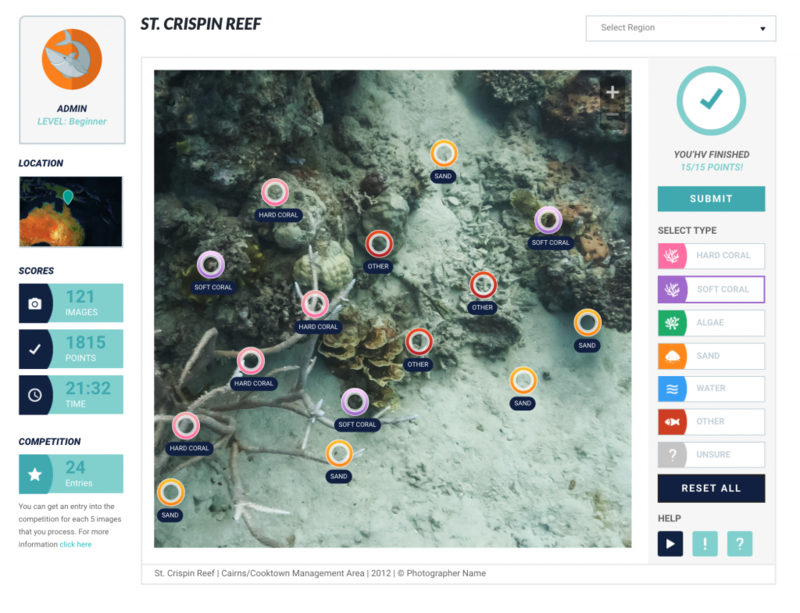 It aims to create a virtual reef by geotagging underwater photos and videos contributed through citizen science. This information is used to improve estimates and predictions of the health of the Reef. You are invited to participate in this project because we’re collecting coral coverage annotation data from the general public. Your participation will involve replying to questions while using a web-based environment at a location close to you or otherwise convenient for you. Your responses will be recorded as anonymised text. It will take approximately 30 minutes to do a typical annotation session, but you may annotate more images at your discretion. The image classification experiment will be performed on selected images whereby participants will annotate 15 random points. At each annotation point, participants will be required to decide whether the area within a circle shows the presence of either coral, algae, sand, other, water, or unknown (see Figure 1 below). For each circle, only one option can be selected. Figure 1 Elicitation menu presented to users. The user points at circle and chooses their answer, in this case Coral. Annotation points are recorded as coordinates (i.e. X, Y) and a number value that represents your selection for that annotation (refer to Figure 2 below). Thus, all responses will be recorded as anonymised text. Figure 2 Results of annotated points within the image. Your participation in this project is entirely voluntary. You are free to refuse to participate and there will be no consequences if you choose not to participate. If you do agree to participate you can withdraw from the project without comment or penalty. You also have the option to register to participate as an uploader. 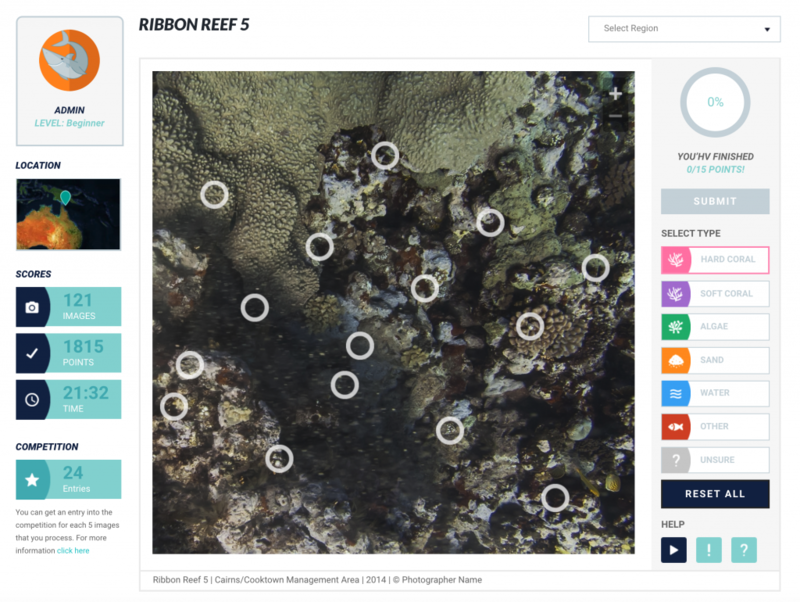 This will allow you to upload your own photos of the Great Barrier Reef for annotation by other users of the website. You’ll have the opportunity to add additional information about each photograph, including the location where you took the photograph and the equipment you used. use of the image for other future scientific (non-commercial) purposes by QUT, other coral reef monitoring organisations and any other organisation including any partners listed on the website. It is expected that this project will not benefit you directly. However, it may benefit you indirectly by improving your knowledge of the components of the reef and how they relate to data collection efforts on the GBR and in the rest of the world. Participants’ contributions will also assist in the development of new methods utilizing technology for environmental management. There are no risks beyond normal day-to-day living or use of laptop/desktop PCs associated with your participation in this project. By agreeing to participate in the research we will ask you to provide us with your name and email address. The information we collect from you will be used to acknowledge your contribution to the project and enable us to contact you about the information if necessary/update you about the research project. We will request on the site that you explicitly consent to be contacted by us regarding further information about this project, possible competition prizes and explicit consent for future use of your data in research by the research team. All comments and responses will be treated confidentially unless required by law. The information we report from your questionnaire will not be connected with you in any of our publications unless you explicitly provide consent for us to associate your identity with your responses. Your responses are recorded only for research purposes and will not affect the livelihood of you or the people in your community/area. The research is funded by the CRC for Spatial Information, QLD Department of Natural Resources, Mines and Energy, the Australian Broadcasting Commission, QUT Science and Engineering Faculty, QUT Institute for Future Environments and crowd-sourced funding from QUT Giving Day. The external funding bodies will not have access to the identifiable information recorded in this experiment, they will only have access to summarised de-identified data. Non-identifiable data collected in this project may be used as comparative data in future projects. It will be stored on an open access database for secondary analysis however no information published will be personally identifiable. Any data collected as part of this project will be stored securely as per QUT’s Management of research data policy. Due to the nature of the project, the environment in which the study is undertaken and to ensure full understanding and effective consent, a secure electronic record of your consent aligned with your account will be stored securely upon the participants doing the study on the website. QUT is committed to research integrity and the ethical conduct of research projects. However, if you do have any concerns or complaints about the ethical conduct of the project you may contact the QUT Research Ethics Advisory Team on 07 3138 5123 or email humanethics@qut.edu.au. The QUT Research Ethics Advisory Team is not connected with the research project and can facilitate a resolution to your concern in an impartial manner. PLEASE PRINT THIS PAGE FOR YOUR INFORMATION.